Everyone has their favorite thing to watch on TV when they feel like “vegging out” and unwinding from a tough day, week, month, or year. One of my favorite TV stops happens to be the late night programs on the Food Network. I seem to enjoy watching people compete to build the tallest cake shaped like a Dr. Seuss character or feed a crowd of a thousand in just seven hours with ramen noodles, ketchup packets and a couple of dull knives. But when I really, really want to unwind, I take a short walk north from my front door and watch Horse TV. I know what you’re thinking—there’s no such thing as “Horse TV”. I beg to differ. If you stand still and look through a rectangular frame-device at horse for hours on end, you are watching Horse TV. It makes no difference if the frame-device is called a “fence” or a television screen. The end result is the same. You enjoy crystal clear HD reception on Horse TV. Plus, you really get a three-dimension experience of smells and sounds and touch. I like to make those horsey “snickers and snorts” back and forth to the big guys and watch their reactions. (They tend to mosey on off further into the pasture and ignore me. “Stupid human trying to fool us that she can talk to us,” is what they’re thinking, I’m sure.) Some of the smells… Well, I could live without the horse manure scents, but the velvety softness of a glossy horse’s coat and petting a fuzzy muzzle more than makes up for that unpleasantness. I’d better clarify what I really mean before my readers start calling the guys with the straight jackets. Grant’s Farm (http://www.grantsfarm.com/) lies adjacent to my neighborhood. 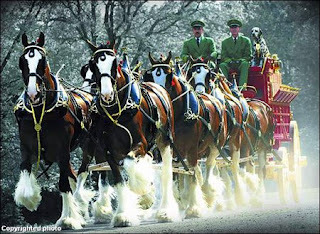 It’s the home of the world famous Anheuser-Busch Clydesdale horses. Grant’s Trail, a converted railroad track, now a bike and pedestrian trail, is spittin’ distance from my computer. 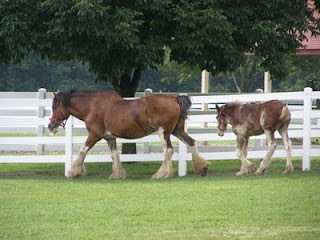 So whenever I need to take a break from the stress and the computer (one in the same recently when my hard drive melted down), I head on up the trail and watch the Clydesdales at play. The farm is actually a deer park and tourist attraction, but it’s a very accessible one. The newborn foals there will let you pet them through the fence if you’re lucky. 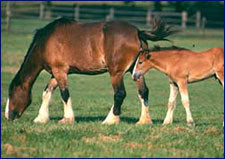 There are mother horses watching over their young, and big, strapping pulling horses out munching breakfast, lunch and dinner… In fact, their muzzles seem permanently glued to the ground. If they’re not pulling that beer wagon, they seem to be chomping away constantly. Hard work must create a huge hunger. Their lives seem serene and complete for the most part to me. They are well fed and cared for—they are beautiful and majestic and don’t mind being put on display. For horses—or human beings for that matter—they seem the contentest of creatures on the face of the earth. And that’s why I enjoy watching the horses whenever I need to unwind. I’m hoping some of that immense contentment will wash off on me. What do you do to unwind after a particular tough time? Is it always the same thing or do you do different things? Do you watch Horse TV? Share one of your unwinding experiences or relaxation techniques here in the comments section, and I’ll put your name in the hat for my next monthly prize drawing. Thanking you in advance… I’m off now to check out how clear the reception is today at the fence. Great shots of the horses. BTW...there is an equine cable network or at least there used to be. The only thing I really remember about it is that when I watched some horse related event on cable there would be a commercial for the network. One of those "if you are interested contact your local cable station" kind of things. Larry and I used to watch a lot of jumping events. And now that I think about it I haven't seen anything on cable with horse related events in a long time. But then I've not browsed the sports networks in a long time either. Which is probably the reason. Yes, there is such a thing. Check out horsetv.com. We are relaunching HorseTV which was created in 2005 and has recently changed ownership. For the time being you can watch a multitude of horse channels at nickernetwork.com. Please contact us at news@horsetv.com. Cindy, you are so lucky to get to see these beautiful horses on a regular basis. Gorgeous pictures of them! Horses, when I was young I couldn't understand why all the other girls were so interested of them...Now we live near a stable with about 20 horses and I love to watch them. It's so relaxing...Or I take a long walk, we have wonderful parks. Although I must admit, when I really want to forget everything I read....Give me a good romance and I forget everything! www.saddleonline.com here you can check and it has premium, synthetic saddle, english saddle, Australian saddle.